The European Space Agency (ESA) carries out ATHENA mission (Advanced Telescope for High Energy Astrophysics) as part of the `Cosmic Vision` science program. The cost of the project will exceed EUR 900 million. The goal of the mission will be to find answers to great scientific questions about the formation of galaxy groups. Researchers will also try to find out how black holes grow and how they affect the shape of the universe. In practice, the device is a huge, 12-meter X-ray telescope that will allow to study phenomena such as gamma-ray bursts, magnetic interactions between extrasolar planets and their stars, gasses that surround galaxy groups, polar aurora of Jupiter and comets in our solar system. The telescope will perform many spot observations of selected fragments of the Universe. About 300 observations per year are assumed, each of them would last an average of 105 seconds. The ATHENA telescope will consist of two independent instruments: the X-ray Integral Field Unit (X-IFU) and the Wide Field Imager (WFI) for measuring X-rays. Engineers from SENER Polska - under contract with ESA - will design the Instrument Selection Mechanism (ISM). It will enable the use of one large mirror for the needs of the above two instruments. But that`s not all: in February the company signed another contract with ESA. 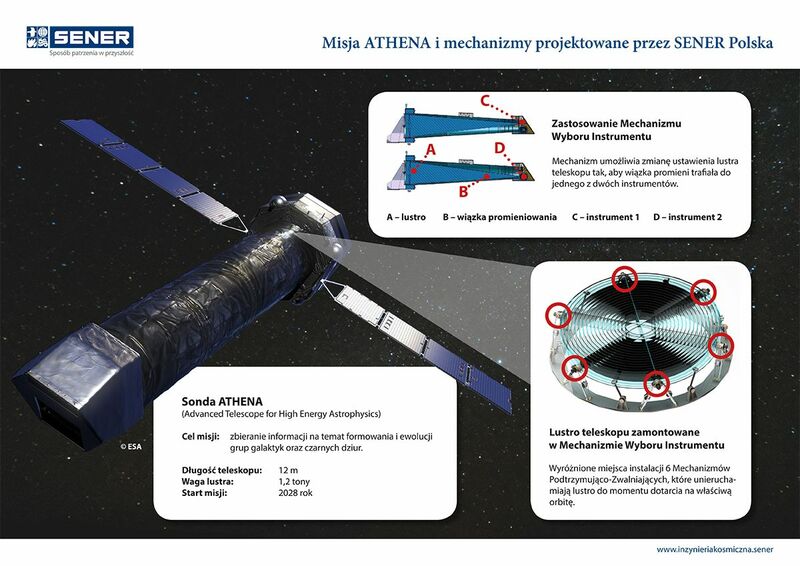 SENER Polska will design, manufacture and test the prototype of the Hold Down and Release Actuator (HDRA) for the ATHENA telescope mirror. The ISM tool is used to change the telescope mirror position so that the beam of rays reaches one of the two instruments: the X-ray Integral Field Unit or the Wide Field Imager. It allows to use one large mirror for the needs of two instruments. The purpose of the HDRA mechanism is to ensure that the huge telescope mirror remains immobilized until the telescope is in the correct orbit. Then the mechanism will be released and it will be possible to move the telescope mirror. "The greatest challenge in this project are the high loads resulting from the huge size of the mirror - its diameter will be more than two meters, and the weight - over a ton. Release mechanisms must be reliable. The mirror will be held by six devices. If they do not withstand the loads and fail during the launch, the mirror will be damaged. If, in turn, any of them does not work properly and fails to release the mirror, it will remain motionless and the telescope will not be able to accomplish its mission" - says Marcin Wygachiewicz, project manager at SENER Polska, quoted in the press release. The ESA`s tender for HDRA releasing mechanisms was addressed only to Polish companies. It is funded by the Science Core Technology Programme (CTP), the purpose of which is to develop new technologies for future scientific missions. All stages of the project will be completed by SENER Polska in cooperation with other Polish companies. The telescope will be placed in a tight orbit around the so-called L2 point. It is the place between the Earth and the Moon, where the gravitational forces of these two objects are balanced. This is a rather popular orbit for missions designed to study the distant Universe, because it provides stable thermal conditions for the operation of observation devices and the possibility of uninterrupted study of selected parts of the sky.